To experience health benefits from probiotic supplementation, it’s important to understand which attributes make a probiotic effective. Before determining which probiotics, the source, and the amounts, it is important to determine the intention of using such an intervention. Probiotics are often used for general health or as a means to restore normal function after an insult to one’s health. Further, probiotics can be used for specific and targeted support given an individual’s health status. Starting with why or with the end in mind can narrow down the vast selection process that must take place next. The quantity and strains of a probiotic don’t matter if they are not stable. A good manufacturer will have testing on file and can verify that the product has met all requirements to ensure the product remains stable throughout shelf life, when stored according to the directions. Look for a supplement that lists an expiration date. 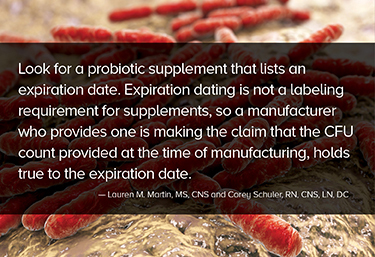 Expiration dating is not a labeling requirement for supplements, so a manufacturer who provides one is making the claim that the CFU count provided at the time of manufacturing, holds true to the expiration date. Gas and light permeability through the packaging can influence the survival of probiotics.4 Probiotic supplements are typically packaged in opaque material to protect the probiotics from light and oxygen. Certain plastics are better for probiotics. Some probiotics are packaged in a box rather than a bottle and may even have an oxygen-barrier blister pack where each capsule is individually protected. Also – note the storage requirements. Almost all probiotics used to require refrigeration; however, new processing techniques have allowed some probiotics to be stored at room temperature. Once consumed, survival includes the ability for the strains to reach their destination – the intestines, while surviving stomach acid. But wait, that’s not all. The relevant number of colony forming units has yet to be addressed. While 10 million CFUs was referenced earlier, probiotics can range up to 900 billion CFUs (with most products in the 1 to 50 billion range.) How many CFUs are necessary for the intended health benefit? * That’s largely unanswered but information continues to published in this regard. Dose, type, delivery, preparation, packaging, and storage are all decision factors in regards to probiotics. That means, the innocent question of “what’s the best probiotic?” quickly becomes complex. Lauren Martin is a Certified Nutrition Specialist who earned a Master of Science in Human Nutrition from Columbia University. She co-founded Martin Family Style, a lifestyle, food and nutrition blog. Lauren is the lead author of the blog's nutrition section. She earned her Bachelor of Science in Nutrition from Oklahoma State University. Dr. Schuler is an adjunct assistant professor at the School of Applied Clinical Nutrition at New York Chiropractic College. He volunteers for the Board of Certification for Nutrition Specialists and is a member of Institute for Functional Medicine, American College of Nutrition, and American Nutrition Association. He has conducted dozens of national seminars, media, and podcast interviews including CBS-WCCO and other radio stations, Intelligent Medicine, Underground Wellness, Five to Thrive Live, Aging but Dangerous, Rebel Health Tribe, and countless online summit appearances.He is on the board of directors for the International Probiotics Association andan advisor to Functional Medicine University. 1. Chaikham P. Stability of probiotics encapsulated with Thai herbal extracts in fruit juices and yoghurt during refrigerated storage. Food Bioscience. 12/1/ 2015;12:61-6. 3. Ying D, Sanguansri L, Weerakkody R, et al. Effect of encapsulant matrix on stability of microencapsulated probiotics. Journal of Functional Foods. 8// 2016;25:447-58. 4. Tripathi MK, Giri SK. Probiotic functional foods: Survival of probiotics during processing and storage. Journal of Functional Foods. 7// 2014;9:225-41.